Featured paper: New ozone sensor based on nanorods of silver tungstate. A study carried out by a research group from Brazil, with collaboration from French and Spanish scientists, has reported, for the first time, gas detection properties in nanorods of silver tungstate in its alpha phase (α-Ag2WO4).The study showed that this material can be applied as a resistive sensor, displaying great performance when detecting ozone (O3). The work was and coordinated by Elson Longo, Professor at the São Paulo State University “Júlio de Mesquita Filho” (UNESP). Resistive gas sensors are basically built from a material capable of changing its electrical properties when molecules of a certain gas are adsorbed in its surface. In the specific case of the silver tungstate, when it is submitted to an oxidant gas such as ozone, there is an increase in its electrical resistance that is proportional to the presence and concentration of the gas. SEM image of the nanorods inside a diagram showing the sensor performance. In this work, the Brazilian scientists synthesized nanorods of silver tungstate and assembled a sensor based on such nanoparticles. They had put the sensor in a temperature controlled test chamber, exposed it to different concentrations of ozone gas, from 80 to 930 parts per billion (ppb), and evaluated its capacity to detect the ozone. Present in high atmospheric layers, the ozone plays an important role protecting living beings by absorbing the solar ultraviolet radiation. The ozone is also used by people in several applications, such as, for example, cleaning water. However, the exposition to the gas in certain concentrations may lead to health issues as headache, burning and irritation in the eyes, and respiratory system problems. The World Health Organization (WHO) recommends avoiding the exposure to ozone gas above 120 ppb. “Subjecting the compound to low amounts of ozone, we observed a fast response, as well as a very short recovering time, making its properties comparable or even better than traditional sensors as tin dioxide (SnO2), tungsten trioxide (WO3), and indium oxide (In2O3),” says Luís Fernando da Silva, first author of the article and postdoctoral fellow of the São Paulo Research Foundation (Fapesp) at UNESP’s Chemistry Institute of Araraquara. The results were published online in the peer reviewed journal Nanoscale in the end of January this year. The studies with silver tungstate started in the postdoctoral research of Laécio Cavalcante, currently a Professor at Piauí State University (UESPI). 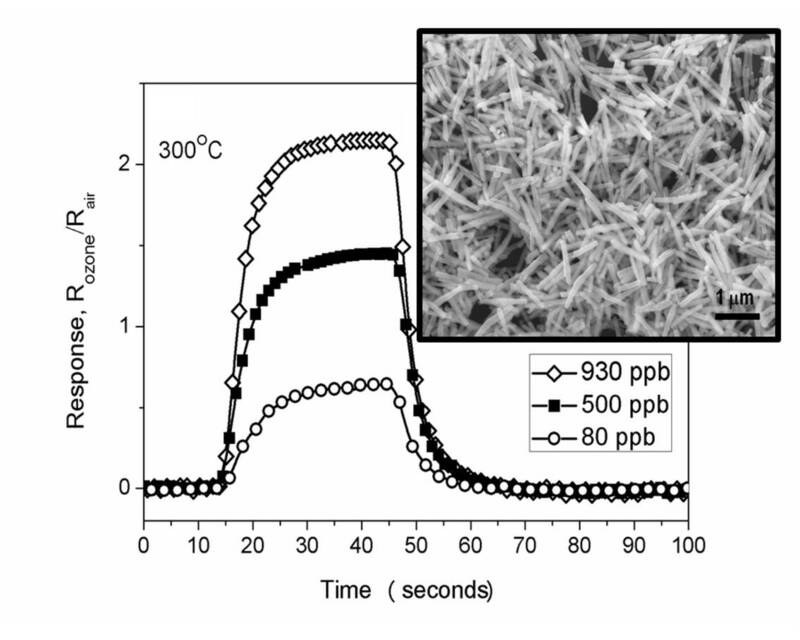 Cavalcante synthesized nanorods of silver tungstate using microwave-assisted hydrothermal technique (process that was also used in the synthesis of nanorods from the paper published by Nanoscale). Performing electronic microscopic analysis with the microscope of the Chemistry Institute of Araraquara, the group of scientists coordinated by Professor Longo noticed that the interaction of the electron beam with the material was stimulating the growth of metallic silver particles on the surface of the nanorods. The result of this paper led to an article published in April last year by Scientific Reports (DOI: 10.1038/srep01676). “Since then, Professor Elson Longo has researched and encouraged the investigation of the potentiality of the α-Ag2WO4 compound”, comments Luís Fernando da Silva. Longo, his team and partners have already observed that the material holds bactericidal (J. Phys. Chem. A, 2014; Doi:10.1021/jp410564p), photoluminescent (J. Phys. Chem. C, 2014, DOI: 10.1021/jp408167v), and photocatalytic properties, with a series of possible applications. “Based on these potential applications”, Luís Fernando da Silva adds, “I, Professor Waltir Avansi Junior from the Physics Department of the Federal University of São Carlos (UFSCar), jointly with Professor Valmor Mastelaro from the São Carlos Physics Institute of São Paulo University (USP) and his PhD student, Ariadne Catto, started investigating about the detection properties of the non-irradiated α-Ag2WO4 compound (without nanoparticles of metallic silver)”. During the experiments, Silva says, the team noticed that the material was sensitive to detect ethanol and acetone steam and, ultimately, ozone gas, even in low amounts. Assisted by Professors Khalifa Aguir from Université Aix-Marseille (Marseille, France), and Juan Andrés, from Universitat Jaume I (Castelló, Spain), they prepared the communication published by Nanoscale, a renowned journal in the nanotechnology field. The studies concerning silver tungstate performed by the team of Professor Longo might not end there. According to Luís Fernando da Silva, the team will assess the capacities of the material to detect other gases. In addition to that, returning to the silver tungstate nanorods with nanoparticles of metallic silver, the scientists are going to study the effects of electron irradiation on the gas detection capacity of the material. “This paper contributes to the discovering of new materials applied as gas sensors”, states the postdoctoral fellow. “However, complementary examinations are necessary in order to achieve a deeper comprehension of the mechanisms involved in the detection, adsorption and desorption processes of the gas(es)”, he concludes.